Over the past few decades, China has achieved unprecedentedly high rates of economic growth, completely transforming its economy and increasing its GDP by almost tenfold. This tremendous economic growth, coupled with rapid urbanization, has naturally resulted in a sharp rise in China’s demand for energy and electricity. Historically, China has used its waterways and railroads to supply the nation with energy, shipping billions of tons of coal  to light its urban centers, power its industry, and support its burgeoning economy. However, with its staggeringly high amounts of air pollution and the more widespread use of renewable energy technologies across the nation, China has been developing and deploying a more modern, more efficient way to ensure the steady flow of energy: high voltage direct current (HVDC) transmission. Source: Cao, Junzheng, and Jim Y. Cai. HVDC in China. Palo Alto: EPRI 2013 HVDC & FACTS Conference, 28 Aug. 2013. PDF. With regards to those projects constructed between 2001 and 2010, there are some general commonalities. The vast majority of the HVDC projects are designed for bulk transport of power, given the distance spanned by the projects and the high power capacity of the cables themselves. [9, 12] In addition, many of these projects, such as the Tianshengqiao-Guangzhou project and the Three Gorges-Changzhou project, carry electricity generated through hydropower, demonstrating hydropower’s central importance in China’s energy economy. However, there are also several HVDC projects that span a much shorter distance and have a much lower voltage capacity than the others. China has termed these cable projects as “back-to-back” projects, which are designed to connect two otherwise unconnected AC electricity grids. [9, 12] Thus, during this period of time, the Chinese appears to have been interested not only in long-distance bulk transport of power, but also in crafting a stronger, more connected grid. 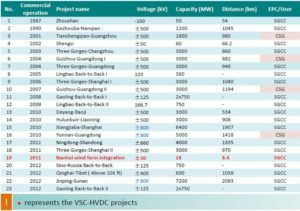 Both China’s need for greater transmission capacity and its great interest in UHVDC technology are evident by the projects that China intended to build between 2013 and 2015 (see Figure 2). Of the fifteen aforementioned projects, eleven of them span very large distances and have high power capacities, indicating that they are intended for large-scale bulk power transport. Moreover, out of these eleven projects, ten of them utilize UHVDC cables, with one of the ten utilizing UHVDC cables that can achieve voltages up to 1100 kV. Thus, it is very likely that China will continue to invest heavily in the deployment of UHVDC transmission as well as research to further increase the maximum voltage (and therefore the maximum amount of power that can be carried through that cable) for UHVDC cables. The exact cost of an HVDC project is generally difficult to determine, given that each project has different factors (e.g. transmission distance, rated power) that will need to be taken into account. However, general estimates can be provided based on knowledge of previous projects. For instance, the Southern Hami-Zhengzhou HVDC line is a massive project, extending a total distance of 2200 km as it travels from Xinjiang province in the northwest down to Henan province in central China. [22, 23] Utilizing 800 kV cables, the line can supply up to 8000 MW of energy. Furthermore, as one of China’s large-scale HVDC projects, the lines are suspended aboveground. Given these factors, the project ended up costing 23.4 billion yuan (~3.5 billion USD), [22, 23] or roughly 1.8 million USD/ km. Moreover, the recently constructed LingzhouShaoxing HVDC line, which extends from Ningxia Province to Zhejiang Province,  incurred similar costs. Like the Southern Hami-Zhengzhou line, the Lingzhou-Shaoxing line uses 800 kV cables and can supply up to 8000 MW of energy; however, the Lingzhou-Shaoxing line is a bit shorter, spanning 1722 km. Due to these reasons, the project cost 19.5 billion yuan (~2.9 billion USD),  or roughly 1.7 million USD/km. As China (and other nations) more aggressively develops its HVDC network and discovers cheaper, more efficient methods and materials, it is very likely that these costs may be lower in the future. The development of such an HVDC grid has both prompted and been propelled forward by notable innovations and ideas in technology and policy alike. After listing UHVDC development “in the 11th Five-Year and 12th Five-Year Plan, the Action Plan for Air Pollution Prevention and Control and the energy development goal of the 12th Five-Year Plan,”  China has steadily directed its research centers and manufacturing base to create HVDC transmission technology of greater quality and in greater quantities. Technologically, China continues to discover new methods and techniques to improve its HVDC transmission, while it also institutes policies that enable the continued and steady production of more HVDC transmission components. 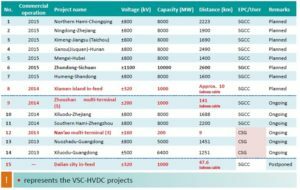 Chinese HVDC projects. Thus, China has been able to not only cultivate a strong manufacturing base for HVDC technology, but also slowly substitute imported components with domestically produced, cheaper parts. [9, 35] Thus, through its shrewd policy of information sharing, the Chinese government has been able to create new jobs, lower the cost of its HVDC projects, and become more self-sufficient in creating said HVDC projects. These goals are, in no small part, motivated by China’s future plans for its HVDC network. China’s interest in 1100 UHVDC technology stems from its desire to utilize its energy resources in Xinjiang Province and Tibet through HVDC technology. Xinjiang Province contains the most fossil fuel reserves than any other province and ranks second in terms of wind energy and solar energy resources. On the other hand, Tibet, while lacking in fossil fuels, possesses vast hydroelectric and geothermal energy resources. Seeing as these two are the westernmost provinces of China, far from the cities and industrial centers of eastern and central China, any HVDC project seeking to take advantage of these resources will require extremely high voltages to be economically feasible. Therefore, as China refines its 1100 kV HVDC transmission technology, it is very likely that China will build future HVDC projects that will connect Xinjiang and Tibet to its central and eastern provinces. Moreover, China will likely continue to build HVDC projects that will service its major population centers (e.g. Shanghai, Guangzhou), so as to keep up with the ballooning energy demand. Naturally there would also be major differences between the Chinese approach and any potential U.S. approach to developing an HVDC network. In the U.S., power companies wishing to construct transmission lines (including HVDC lines) must negotiate right-of-way agreements with the owners of every single property that the lines would pass through, a process that would add more costs to a nationwide HVDC network. Moreover, since a large-scale HVDC network in the United States would likely have to be buried underground, due to both the right-of-way situation and safety reasons, the cost for a U.S. HVDC project would be higher than an equivalent one in China. Nevertheless, China’s example shows that it is indeed possible for the U.S. to construct a large-scale nationwide HVDC network, given that a few factors are present. First and foremost, the political will for such an undertaking is absolutely crucial to the creation of a national HVDC network. Given the scale and capital-intensive nature of such a project, the federal government would need to be fully committed to the network’s development to ensure that it is implemented successfully. Moreover, implementing a “knowledge-sharing” policy similar to China’s would accelerate the construction process by building U.S. expertise in HVDC technology. Moreover, such a policy would help build a manufacturing base in the U.S. for HVDC equipment and components, adding new jobs and contributing toward economic growth. China has faced extraordinary challenges in the energy realm, and it has developed unprecedented solutions to meet those challenges. Confronted with quickly burgeoning energy demand and great distances between its energy resources and energy loads, China decided to craft an HVDC cable network, an “energy superhighway” system that would connect the nation and address its energy problems. While initial progress was slow, China quickly accelerated the development of its HVDC network, fueled by economic growth and smart policy. In its eager pursuit of a more effective, more cohesive HVDC network, China has pioneered new methods and new technologies, contributing such innovations as 1100 kV UHVDC technology and VSCHVDC. Indeed, today, China is leading the world in HVDC development and has fully incorporated HVDC transmission as a core tenet of its energy policy, a testament to the importance and usefulness of the technology. As more countries face an increasing need to optimize their energy system and confront rising energy demand, they would do well to look at China for a glimpse of how HVDC technology can help create a more efficient and more resilient electricity grid. 1) “China.” The World Factbook. Central Intelligence Agency, 15 Aug. 2016. Web. 16 Aug. 2016. <https://www.cia.gov/library/publications/the-world-factbook/geos/ch.html>. 2.) “U.S. Energy Information Administration – EIA – Independent Statistics and Analysis.” China Consumes Nearly as Much Coal as the Rest of the World Combined. US Department of Energy, 29 Jan. 2013. Web. 16 Aug. 2016. <http://www.eia.gov/todayinenergy/detail.cfm?id=9751>. 3.) The History of DC Transmission. Clean Line Energy Partners, 2016. Web. 16 Aug. 2016. <http://www.cleanlineenergy.com/technology/hvdc/history>. 4.) Wang, Hualei, and M.A. Redfern. “The Advantages and Disadvantages of Using HVDC to Interconnect AC Networks.” Universities Power Engineering Conference (2010): n. pag. IEEE. Web. 6.) Hingorani, Narain. “The Evolution of HVDC Transmission.” The Evolution of HVDC Transmission. Penton, 1 Apr. 2012. Web. 17 Aug. 2016. <http://tdworld.com/transmission/evolution-hvdctransmission>. 7.) Csanyi, Edvard. 8 Main Disadvantages of HVDC Transmission. Electrical Engineering Portal, 10 Jan. 2014. Web. 17 Aug. 2016. <http://electrical-engineering-portal.com/8-main-disadvantages-ofhvdc-transmission>. 8.) Lei, Xianzhang. Practice of HVDC Transmission Technology in China. N.p. : State Grid Corporation of China, Oct. 2011. PDF. 9.) Cao, Junzheng, and Jim Y. Cai. HVDC in China. Palo Alto: EPRI 2013 HVDC & FACTS Conference, 28 Aug. 2013. PDF. 10.) China Enters a Golden Era of Developing UHV. State Grid Corporation of China, 16 May 2014. Web. 18 Aug. 2016. <http://www.sgcc.com.cn/ywlm/mediacenter/corporatenews/05/306406.shtml>. 11.) Pudney, Dale. “A Review of HVDC in China.” Transmission and Distribution(2012): n. pag. Transmission and Distribution, Apr. 2012. Web. 18 Aug. 2016. <http://www.ee.co.za/wpcontent/uploads/legacy/energize_2012/07_TT_02_A%20review-of-HVDC.pdf>. 12.) Cheng, Lin, Hua Feng, and Jian He. “HVDC Development and Its Reliability in China.” Power and Energy Society General Meeting (2013): n. pag. IEEE. Web. 18 Aug. 2016. 13.) Mishima, Mitsue. Tianshengqiao First Hydropower Project (1)-(4). Rep. N.p. : n.p., 2004. Print. 14.) “Xiangjiaba – Shanghai.” ABB Group. ABB, 2016. Web. 18 Aug. 2016. <http://new.abb.com/systems/hvdc/references/xiangjiaba—shanghai>. 15.) Siemens Power Transmission and Distribution. “China to Construct High-Voltage Transmission System Between Yunnan, Guangdong.” Penton, 11 June 2007. Web. 18 Aug. 2016. <http://tdworld.com/overhead-transmission/china-construct-high-voltage-transmission-systembetween-yunnan-guangdong>. 17.) Davies, M., M. Dommaschk, J. Dorn, J. Lang, D. Retzmann, and D. Soeranger. HVDC PLUS – Basics and Principle of Operation. Tech. Siemens, 2009. Web. 18 Aug. 2016. <http://www.energy.siemens.com/br/pool/br/transmissao-de-energia/transformadores/hvdc-plusbasics-and-principle-of-operation.pdf>. 18.) Csanyi, Edvard. Analysing the Costs of High Voltage Direct Current (HVDC) Transmission. Electrical Engineering Portal, 6 Aug. 2014. Web. 18 Aug. 2016. <http://electrical-engineeringportal.com/analysing-the-costs-of-high-voltage-direct-current-hvdc-transmission#5>. 19) “Zhoushan Multi-Terminal VSC-HVDC Project Was Put Into Service.” NR Electric Co., 2 July 2014. Web. <http://www.nrec.com/en/news-content-253.html>. 20.) Li, Xiaolin. “Nanao Multi-terminal VSC-HVDC Project for Integrating Large-scale Wind Generation.” IEEE Xplore Document. IEEE PES General Meeting, 30 Oct. 2014. Web. 19 Aug. 2016. <http://ieeexplore.ieee.org/document/6939123/?reload=true&tp=&arnumber=6939123&url=http %3A%2F%2Fieeexplore.ieee.org%2Fiel7%2F6916492%2F6938773%2F06939123.pdf%3Farnu mber%3D6939123>. 21.) “China Set for a GW-scale Offshore Wind Market in 2016 – Bloomberg New Energy Finance.” Bloomberg New Energy Finance. Bloomberg Finance LP, 2016. Web. 19 Aug. 2016. <http://about.bnef.com/landing-pages/china-set-for-a-gw-scale-offshore-wind-market-in-2016/>. 22.) “Southern Hami-Zhengzhou ±800kV UHVDC Transmission Project, Second Xinjiang-Northwest Main Grid 750kV HVDC Transmission Line Start Construction to Build the Silk Road of Electricity Connecting the Western Frontier with the Central Plains.” State Grid Corporation of China, 14 May 21012. Web. 19 Aug. 2016. <http://www.sgcc.com.cn/ywlm/mediacenter/corporatenews/05/272889.shtml>. 23.) Wang, Ucilia. “China Building Super Highway for Clean Power.” Gigaom. Knowingly, Inc., 14 May 2012. Web. 19 Aug. 2016. <https://gigaom.com/2012/05/14/china-building-super-highway-forclean-power/>. 25.) “Níngxià Níng Dōng-shàoxīng ±800 Qiān Fútè Gāoyā Shūdiàn Gōngchéng Dònggōng [The Start of the ±800 kV Ningxia Ningdong-Shaoxing UHV Transmission Project].” Trans. Charlie Xu. Běijíxīng Shū Pèi Diànwǎng [Polaris Transmission and Distribution Network]., 23 Mar. 2015. Web. 23 Aug. 2016. <http://m.bjx.com.cn/default.aspx/600466/?from=singlemessage&isappinstalled=0#10006weixin-1-52626-6b3bffd01fdde4900130bc5a2751b6d1>. 26.) Zehong, Liu, Gao Liying, Wang Zuli, Yu Jun, Zhang Jin, and Lu Licheng. “R&D Progress of ±1100kV UHVDC Technology.” International Council on Large Electric Systems (2012): n. pag. International Council on Large Electric Systems, 2012. Web. 19 Aug. 2016. 27.) “ABB Wins Orders of over $300 Million for World’s First 1,100 KV UHVDC Power Link in China.” ABB, 19 July 2016. Web. 19 Aug. 2016. <http://www.abb.com/cawp/seitp202/f0f2535bc7672244c1257ff50025264b.aspx>. 28.) Siemens. “Siemens Receives Order for World’s First 1,100-kV HVDC Transformers.” Power Engineering. PennWell Corporation, 11 July 2016. Web. 20 Aug. 2016. <http://www.powereng.com/articles/2016/07/siemens-receives-order-for-world-s-first-1-100-kv-hvdctransformers.html>. 29.) “NR to Protect World’s Highest Voltage ±1100kV UHVDC Transmission Project.” NR Electric Co., 24 May 2016. Web. 20 Aug. 2016. <http://www.nrec.com/en/news-content-371.html>. 30.) “Introduction of the SGRI Profile.” About Us. State Grid Corporation of China, 9 June 2015. Web. 21 Aug. 2016. <http://www.sgri.sgcc.com.cn/html/zyyze/col2004020100/column_2004020100_1.html>. 31.) “Experimental Capability.” HVDC Transmission Field. State Grid Corporation of China, 27 Apr. 2015. Web. 21 Aug. 2016. <http://www.sgri.sgcc.com.cn/html/zyyze/col2004040100/201504/27/20150427175111563271663_1.html>. 32.) “China Electric Power Research Institute (CEPRI).” EtherCAT Technology Group. EtherCAT Technology Group, n.d. Web. 21 Aug. 2016. <https://www.ethercat.org/en/members/members_9C743BF485904A73967596E90C2E84D5.htm >. 34.) Liu, Zehong, Jun Yu, Xianshan Guo, Tao Sun, and Jin Zhang. “Survey of Technologies of Line Commutated Converter Based High Voltage Direct Current Transmission in China.” CSEE Journal of Power and Energy Systems 1.2 (2015): n. pag. IEEE. Web. 21 Aug. 2016. 35.) Bowden, Jeremy. “China Takes HVDC to New Level.” Power Engineering International. PennWell Corporation, 1 June 2013. Web. 21 Aug. 2016. <http://www.powerengineeringint.com/articles/print/volume-21/issue-6/special-focushvdc/china-takes-hvdc-to-new-level.html>. 36.) “Four Bases and Two Centers.” State Grid Corporation of China, 25 Oct. 2010. Web. 21 Aug. 2016. <http://www.sgcc.com.cn/ywlm/projects/brief/10/237086.shtml>. 37.) Duan, Jinhui, Shuying Wei, Ming Zeng, and Yanfang Ju. “The Energy Industry in Xinjiang, China: Potential, Problems, and Solutions.” POWER Magazine. Access Intelligence, LLC, 1 Jan. 2016. Web. 22 Aug. 2016. <http://www.powermag.com/energy-industry-xinjiang-china-potentialproblems-solutions-web/>. 38.) “Natural Resources.” China’s Tibet Facts and Figures 2002. China Internet Information Center, 2002. Web. 22 Aug. 2016. <http://www.china.org.cn/english/tibet-english/zirzy.htm>. 39.) “Electricity.” Our Energy Sources. The National Academy of Sciences, 2016. Web. 22 Aug. 2016. <http://needtoknow.nas.edu/energy/energy-sources/electricity/>. 40.) McDonald, Alexander E., Christopher T.M. Clack, Anneliese Alexander, Adam Dunbar, James Wilczak, and Yuanfu Xie. “Future Cost-competitive Electricity Systems and Their Impact on US CO2 Emissions.” Nature Climate Change 6.5 (2015): n. pag. 25 Jan. 2016. Web. 22 Aug. 2016. <http://www.nature.com/nclimate/journal/v6/n5/full/nclimate2921.html?WT.ec_id=NCLIMATE201605&spMailingID=51246683&spUserID=MTgxNzAzNDYzODEzS0&spJobID=903435134 &spReportId=OTAzNDM1MTM0S0>. 41.) “What Is a Right-Of-Way?” Duke Energy Carolinas. Duke Energy Corporation, n.d. Web. 23 Aug. 2016. <https://www.duke-energy.com/safety/right-of-way-management/what-is-row.aspv>.